I'm on the mailing list for TwoMorrows publishing, whom you may know as the maker of many, many books and mags about Comics. But they are more than just "about" Comics, they are also creating and propagating certain ideas about the medium, and in a sense writing alternate Histories via a form of criticism masked as celebration. Let me explain a little. While there's nothing inferior about Comics as an artform, there is definitely something unhealthy about the Industry today. First, the somewhat rigidly pedestrian tastes of the readership, because the fans basically want the same experience over and over again, though perhaps with infinitesimally slight variations; second, the pressure from those tastes tend to confine the artists to plough the same territory forever. They never develop beyond the ghetto, because the audience won't allow it. TwoMorrows Publishing makes healthy profits from Jack Kirby's work, implying it's somehow a force for positive change in the Industry, or perhaps preservers of heritage, or something. On one hand, there are lengthy exposes about the poor treatment of Kirby by publishers, but TwoMorrows is also a publisher. Are they really a kinder and gentler than larger corporation? New in the emailbox today. There are basic truths people either don't face or can't perceive about Jack Kirby and the ever-inflating myths about his so-called mistreatment, and that is: he showed up as a victim and co-created any troubles he might have had. Similarly, Jews and Nazis also co-created a reality together, as distasteful as that may sound. Kirby was a talented man, but basically, he stepped out in front of a car. Most Comics readers simply have no idea the level and intensity of work required to draw them. Today, it's mainly the domain of the young, who have plenty of raw energy and time. What people generally don't realize while they are ingesting mountains of Kirby is that no one person should ever have done that much work. But you read a comic in five minutes, and that is the extent of it. 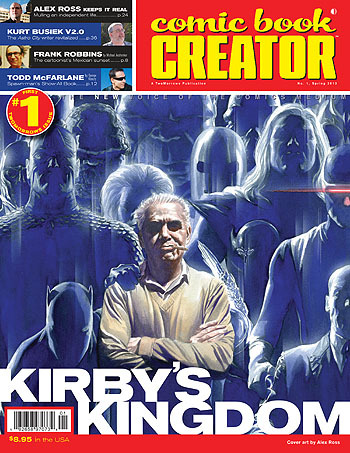 So when it comes to co-creation of awful scenarios of pain and suffering, not only did Kirby volunteer to be abused, but the appetite of the Fans for more and more loaded him down with an inhuman workload. No wonder he couldn't think of any other options. If anyone is to blame, it is the audience as much as the companies. That's just another inherent danger in escaping from reality through Comics or anything else.